I am constantly on the lookout for new money-making opportunities. At weekends especially grinding ANYTHING can be a bit of a mug’s game, because if you’re farming it’s pretty much guaranteed there’s gonna be more than one other player with the same idea. This is why I spend a bit of time in Old Skool instances: resets at your convenience, no competition for mobs… it makes far more sense. That is until Blizzard introduced the Potion of Treasure Finding. The mats, for any alchemist worth their salt and with either a gathering secondary profession or a family of alts, are less prohibitive than they have ever been. The effects give you sixty minutes of access to one of the most useful items that currently drops in game, the Tiny Treasure Chest. Of the TWENTY-SEVEN items that Wowhead say that drop from the chests absolutely none of them are useless: there’s also a decent chance of green items to boot. Each chest drops a nominal amount of gold, but it will be the other treasures that will have you using this potion on a regular basis. The majority of people I know who use this will apply one for their daily Randoms or when they are doing Dailies (as these potions work on the Molten Front) However this weekend I’ve taken P and used these for a concerted far of sub-85 mobs around the Cataclysm zones. There are many areas across the entire 80-85 grind where you will encounter lootable mobs being ‘tanked’ by NPC’s. Whether it’s the starting Elementals in Hyjal, Troggs in Depholm or Naga in Vashj’ir and the Twilight Highlands there are large groups which will not initially aggro when you attack them. This of course is the key, giving you a chance to tag as many as possible before killing them at your leisure. The more you can dispatch at a sitting of course the more likely you are to get a chest and the more money you can potentially earn as a result. As a tailor, picking humanoid mobs also has the advantage of extra cloth drops, the benefits of which cannot be overstated (especially if you still need to max your profession skill) The big earners in my chests are inevitably Volatile Water and Air, the cloth itself and any greens I can DE for mats that are subsequently resold. 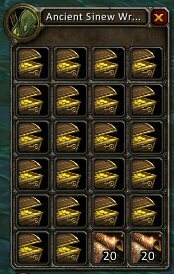 These can also be sent to W and M to contribute to Trugold transmutes or used to make PvP gears on any of the crafters (which seems to be selling very well right now) What you do with your chests is of course entirely up to you. If you’re levelling an alt to 85 this weekend and you’re in any of the zones where these chests have a chance to drop, I’d urge you to seek out an Alchemist and get a stack of these potions to help you on your way. their significance cannot be understated, and the rewards from them are well worth the effort in creating them.